After World War II, white playwrights scripted dramas featuring African American veterans in three Broadway plays: Arnaud d’Usseau and James Gow’s Deep Are the Roots (1945), Robert Ardrey’s Jeb (1946), and Maxine Wood’s On Whitman Avenue (1946). These white leftist playwrights embraced postwar racial liberalism to help redefine racism as undemocratic. African American actors starring in these plays—Ossie Davis, Ruby Dee, Gordon Heath, and Canada Lee—used their newfound stardom to become significant cultural leaders of the civil rights movement. 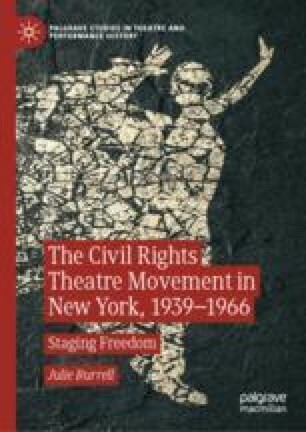 Despite the productions’ attempt to frame anti-Jim Crow activism as an extension of the war against fascism on the homefront, actors and writers involved in civil rights theatre of the 1940s were targeted by anti-Communists of the early Cold War and frequently blacklisted.